Winemaker’s Notes: Bouquet overwhelmed by ripe fruit, succulent, full of energy and freshness. Beautiful complexity with floral envelopment, slight wooden cosiness that is smoothened by a very well structured body and deeply marked by spices and vegetable notes. My Review: It’s a good thing I didn’t resolve to write more in the new year, because I have been bad about keeping up with my reviews. Oh well, at least I’m getting around to it while I can still understand my notes. That’s something I suppose. So back before the end of the year I was sent a pack of Portuguese wine. I accepted these for several reasons, not the least of which was wanting to explore wine from a country that I’ve had before, but usually what I could find at my local Total Wine. 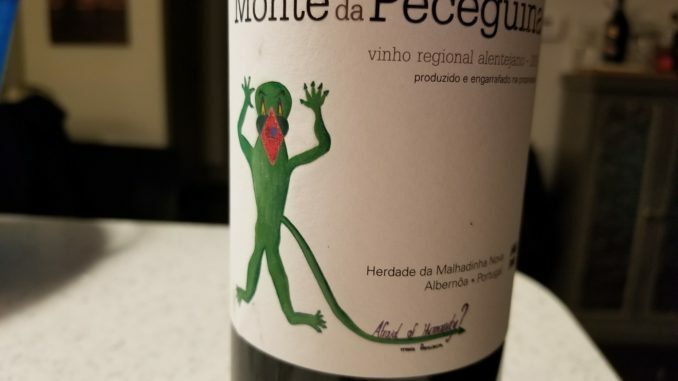 The 2015 Monte da Peceguina is a prime example of why I wanted to try these wines – I recognize exactly three of the grapes that make up this wine. To me, that’s pretty awesome. So what did I think of a wine made from grapes I’d largely never heard of before? To be honest…I liked it. In the glass the wine was a dark red colour. The aroma of the wine was hot at first (the wine is 14.5% alc/volume), but it finally gave way to floral notes after allowing it time to open. In the mouth the wine was bright, with floral notes carrying over from the nose and being joined by flavours of tart raspberry and a hint of spice. My wife and I paired the wine with grilled cheese sandwiches and roasted red pepper and tomato soup (it was a cold day). The bright, tart notes of the wine did a great job of cutting through the richness of the cheese and the soup. I’ll be honest, for sub $20, I really like this wine. It’s approachable, easy to drink, and I suspect you could pair it with a range of foods (or with nothing at all). I may not be familiar with all of the grapes, but I know they add up to make a solid wine, and one that’s great when you’re budget conscious, but looking to break outside your comfort zone.